Hello good day. My name is María Sol and I am 26 years old. I am Argentine, I am currently in Europe and on September 28 I will be in the United Kingdom. My idea is to get a job and if it has connection with the animal world it would be a pleasure. I am responsible, friendly and I adapt easily to the conditions that are presented to me. I have time availability and my English is basic, which I want to perfect. I do not have children or a couple. I want to do a job where I can be a dog waker, walk dogs during the day, take care of animals, do canine or feline lodging at home. For me the animals are members of my family and I feel them very close. It is worth clarifying that I am a vegetarian, that highlights my animal love. Since I was little I grew up in a house with canines. Living with them changes my mood and my energy. My first pet was a street dog called "Lola", she accompanied me for 17 years, her departure during this year was very sad but I am glad to know that I gave her, together with my family, a very happy and pleasant life. I always took into account his care, and his health was a priority. She was a very playful dog and loved caresses. After Lola died, it was very hard for my family and having a pet would change that sadness. So I decided to approach a pet shelter to adopt again. 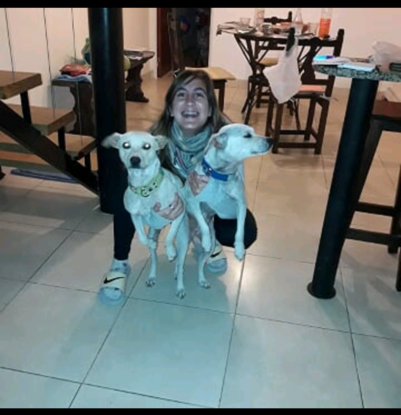 When I arrived at the shelter I found two dog that had been abandoned in a dump. 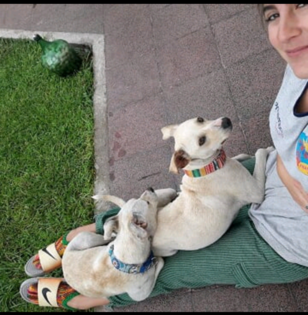 I fell in love with them, and I took them to my house to be part of our family. Her name is "Roberta" and "Bejota". It took their time to recover their status and to be in full. Currently, they are with my parents two months ago, it really changed their lives. Now they are happy animals and have all the love in the world. I love playing with them, taking them for a walk and watching them eat. In addition, I stayed in contact with the shelter to collaborate. Not only do I like dogs, cats love them too, although I never had pets, they take care of them and love them. I learned to separate dogs in case of fights and calm them down and cure them. I am a lifeguard and have worked with rescue dogs in the sea and in the pool. I would love to take care of their pets in their homes, walk them in the day (during the time they think necessary) or take daily walks. I have toys to have fun.